Allowing a double down after splitting pairs : can be advantageous to the player if used wisely. 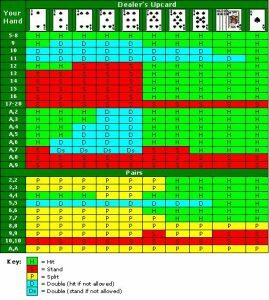 Las Vegas Blackjack games are played with two decks and the House must hit on hands less than soft 17 (17 involving an Ace ) and must stand on hands of 17 or greater. Atlantic City Blackjack games are played with four decks and the House must hit on 16 and stand all 17’s. Blackjack Rules: Learn how to play this game! There is good reason why Blackjack is one of the most popular games in the Casino. The object of the game blackjack is to accumulate cards with point totals as close to 21 without going over 21. Face cards (Jacks, Queens and Kings) are worth 10 points. Aces are worth 1 or 11, whichever is preferable. Numbered cards are worth their face value. To win Blackjack you need to beat the dealer without busting. The winner is whoever has closest to a total of 21. You reach 21 by adding up the values of the cards. If you bust when your cards total to more than 21 you lose automatically. The blackjack table seats about 6 players. Either six or eight decks of cards are used and are shuffled together by the dealer and placed in a card dispensing box called ‘Shoe’ . Before receiving any cards players must place a wager. Then the players are dealt two cards face up. The dealer gets one face up, one face down. Each player in turn either stays or takes more cards to try and get closer to 21 without busting, called ‘Hitting’. Players who stick wait for the dealer’s turn. When all the players are done, the dealer turns up the down card. The dealer must draw on anything lower then a count of 16 and must stay on anything equal or higher then 17. Blackjack!!!! If you make a total of 21 with the first two cards (a 10 or a face and an Ace), you win automatically. If you have Blackjack, you will win one and one-half times your bet unless the dealer also has Blackjack, in which case it is a Push or a Tie (or a Stand-off) and you get your bet back. * Insurance: side bet up to half the initial bet against the dealer having a natural 21 – allowed only when the dealer’s showing card is an Ace. If the dealer has a 10 face down and makes a blackjack, insurance pays at 2-1 odds, but loses if the dealer does not. * Surrender: giving up your hand and lose only half the bet. * Early Surrender: surrender allowed before the dealer checks for blackjack. * Late Surrender: the dealer first checks to see if he has blackjack. If he does, surrender is not permitted. * Double Down: double your initial bet following the initial two-card deal, but you can hit one card only. A good bet if the player is in a strong situation. * Even Money: cashing in your bet immediately at a 1:1 payout ratio when you are dealt a natural blackjack and the dealer’s showing card is an Ace. * Hard Hand: A hand without an Ace, or with an Ace valued at 1 is said to be Hard in that it can only be given one value, unlike a Soft Hand. (You can value an Ace 1 or 11 to suit you). * Soft Hand: A hand that contains an Ace counted as 11 is called a Soft Hand.